There's no hair enemy as fierce and unyielding as the much-dreaded split end. Whether you're young or old, have chemically treated strands or a completely natural hue, you're always at risk of experiencing the phenomenon. In fact, experts tell us those frazzled ends are the number one complaint clients cite when they come in for a cut. 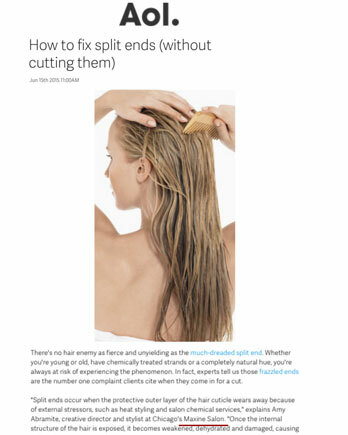 "Split ends occur when the protective outer layer of the hair cuticle wears away because of external stressors, such as heat styling and salon chemical services," explains Amy Abramite, creative director and stylist at Chicago's Maxine Salon. "Once the internal structure of the hair is exposed, it becomes weakened, dehydrated and damaged, causing split ends." While the only true way to rid yourself of roughed ends is to have them snipped off (Bob haircut, anyone? ), there are several things you can do between salon appointments to improve the look of damage and prevent more splits from occurring. Use a wide-tooth comb: After you apply conditioner in the shower, slowly run a wide-tooth comb through hair until all the tangles are out. This prevents the snaps and breakage you can incur when you try to brush out hair that is roughed up from a towel-dry, advises Jessie James, stylist at New York's Marie Robinson salon. Mind your heat tools: That bargain-bin blow-dryer may be a tempting purchase, but inexpensive tools tend to dangerously overheat over time and burn ends into splits, warns James. Instead, use a top-rated economical brand like Remington Style Therapy: Keratin Therapy Hair Dryer, or invest in a professional-grade dryer like FHI Black Diamond Ceramic Digital Hair Dryer. Go gentle: "Imagine wearing a silk blouse every single day. It would get pretty beat up. Treat your hair like an expensive fabric, and it will last longer and look better," says Natasha Sunshine, owner of Santa Monica's Byu-Ti salon. Use only covered elastics with no metal piece, like those made by Goody to tie hair into a ponytail. If looking for a sleek look, rely on products like gel and finishing spray to create a smooth finish, instead of pulling hair too tightly to achieve it alone. Take folic acid and biotin: There's a reason they say you are what you eat: Nutrients literally build the proteins that make up your hair strands. Two B vitamins in particular -- folic acid and biotin -- have been shown to supplement hair health, length and thickness, says Sunshine. Folic acid helps the production of red blood cells, which powers the growth of hair. Foods rich in folic acid include green leafy veggies, oranges, soybeans and wheat. Biotin strengthens both hair and nails through its metabolism of fats, carbs and proteins. Brown rice, lentils, peas, sunflower seeds, walnuts and soybeans are all rich in biotin. Use leave-in conditioner: Conditioners that you rinse out in the shower will do little to nothing for split ends, but a leave-in conditioner will add extra protection that stays on strands as you heat-style and go about your day. Consider Pureology's Essential Repair Split End Correcting Treatment, which you apply after every wash on towel-dried hair for best results. Blow-dry the right way: Always use a nozzle on your dryer to control and direct the flow of air, and dry hair in a downward direction before sectioning off and drying completely with a round brush. This way, you spend far less time with intense heat straight on the hair. "If possible, air drying 90 percent before picking up the blow-dryer is even better," says Sunshine. And of course, if you can naturally dry all the way, that's always your best option. Limit damaging services: There's unfortunately no way around it -- treatments like hair color, highlights, straightening and perms all cause trauma that can result in a bevy of split ends, says Abramite. Try to limit service to just one major hair concern, and refrain from washing strands for at least 48 hours afterward, when they're most porous and likely to break and split. Not only will hair health improve after you go on a chemical-service diet, but your wallet will thank you. Get regular cuts: While a haircut is the only way to get rid of split ends, regular trims are your best protection against them. The longer you wait to trim, the greater chance you have of split ends worsening and traveling up the shaft. It may sound counter-intuitive, but this is why it's actually best to get frequent trims if you're trying to grow longer, healthier hair. Whatever your hair type or style, our experts recommend you get a cut or trim at least every six to eight weeks.